After the 5-0 victory over Borussia Dortmund in the top-of-the-table clash, FC Bayern travel to face Fortuna Düsseldorf on Sunday (live in English from 15.30 CET on our exclusive fcbayern.com ticker), and the Bavarians aim to pick up where they left off and retain the lead in the table. “We’re in the lead again, and we don’t want to give it away,” stressed Niko Kovac at the press talk before Matchday 29. 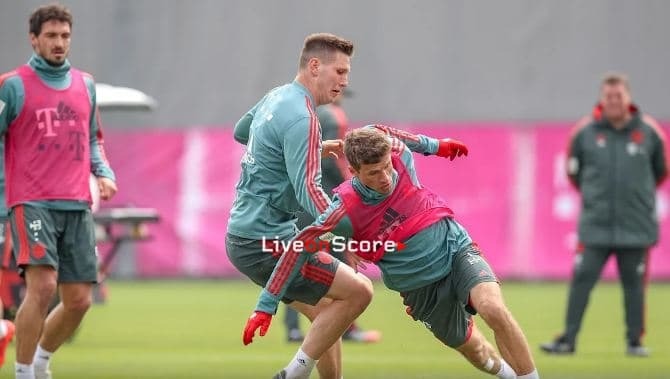 The one-point lead over Dortmund, who face Mainz on Saturday evening, is “extremely tight, so we must approach this difficult away match just as we approached the one against Dortmund. We mustn’t run one centimetre less, fight less or be less aggressive. If so we’ll hopefully come out on top with our quality,” the coach outlined his expectations for Sunday. “Against Dortmund we saw what the team are capable of. We want to do it against Düsseldorf too, but Fortuna are very dangerous at turnovers,” added Kovac, referring to the reverse fixture. Bayern were held to a 3-3 draw, squandering a two-goal lead. “We sat down together after the match and drew the right conclusions. We’ve been on a good, a better track since then, and of course we want to atone for our mistakes in the first match,” declared the Bayern coach. Bayern have won 14 of their 16 league matches since then, reclaiming the lead in the table. The men from Munich must be fully focused and stifle Düsseldorf’s dangerous counters to retain their lead. Alphonso Davies can help them on Sunday. The Canadian has resumed the squad programme after recovering from a stretched inner ligament in his knee. Apart from long-term absentees Arjen Robben and Corentin Tolisso, Franck Ribéry is likely to miss out.